I was thinking the other day that these blogs won't be so super exciting anymore (pretend with me that they were exciting before) now that I am back in the boring UK but then I realized that there are so many differences between here and there (insert your location here) that I may be able to keep up the fun for at least a little while longer. I was thinking of this as I watched TV the other night. Much like with my bunny ears at home I only get 5 channels here so there's limited selection but there always seems to be something interesting on. They love their investigative journalism and the other day I watched a program that tested several different alternative diets and their effect on health. Boring you think. Well one of the diets involved ranchers and probiotics (I won't go into details but there was pooh involved) and the other was an 'ancestral diet' where folks ate like baboons for two weeks to see what it did. Very interesting. They also love real-estate shows. There's always something on about renos or finding your dream home/vacation home. It's a neat way to see how people live not only in the UK but all over europe. The prices are mostly shocking (the cheapest place around here is about 200,000 GBP = $400,000) but the places are always so full of character. There is a lot of original architecture around which makes for personality abound. The third big one is talent competition. It seems they cast most of the West End musicals using TV shows with Danny and Sandy (Grease), Joseph (Joseph) and Maria (Sound of Music) all having been selected by the public (and of course Andrew Lloyd Weber) on tv. I'll have to check out one or two of them live I think. As for me right now...work is hectic. We are training the 'super users' right now and they are a demanding bunch which is causing us to change all kinds of plans and we are getting ready for User Acceptance Testing so it's going to be a full couple of weeks which is fine with me. Work, gym, sleep, work. I think that will keep me busy until the visitors start. YAY! Enjoying a cappacino and thinking of all my coffee buddies (Gege, Phil, Martin). Have a great weekend everyone! September 24 - Photos from India! (sorry Mom!) Conor and the cobra (I was VERY far away at the time). Trip to Agra...the team at the taj.. I'm not sure what was worse for traffic...cows everywhere or Conor driving a tuk tuk! September 24 - Brushing my teeth with tap water! It's true...I am actually brushing my teeth with tap water again and if feels soooo good. In 6 more days I will stop taking anti-malarials and the world will be a happier place (those things make you c-r-a-z-y)! My journey from Mumbai to Woking was an uneventful one and I spent yesterday getting sorted and relaxing. I have cried on two runs during this trip. The first was the day Jay left to go home when we broke up and the second was yesterday. This time I was happy. I love fall runs and I was so happy to be out in the sunshine and free to run where I pleased. Perhaps that's why I ran 10km which I was clearly not ready to do as my quads are telling me today. I am settled into my new flat which is super nice (no bugs or little men sleeping in my kitchen) and have an address so if anyone wants to write let me know. 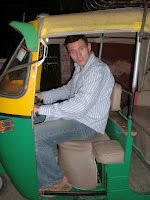 I'll post some more India pics now. Enjoy! So it is finally coming to the end of my 'round the world tour' as tomorrow I head back to the UK. I of course have mixed feelings. The adventure is slowing down (no doubt the european leg will still hold fun times) so I can settle and get comfortable again and into a routine. You all know that routine is my middle name and I think that's be the biggest stress for me these last few months. India has been interesting. The culture and food are amazing. The infrastructure and poverty are shocking. There is such a dicodomy here it is truely in your face. Indian people are proud and humble at the same time. It's a delicately plesant balance that I'll miss. One thing I won't miss is everyone hurrying to help me with everything. I know, that sounds harsh but I really can carry my own suitcase and pour my own waterglass. I don't need help from four people as I look around in a store either. I'll be happy when I am back in the UK where everyone ignores you. I am sure I'll miss the attentiveness eventually....or not. I realized yesterday that I can use our countdown to the system go-live date to count my days until my return. We go live on December 10th and I return December 18th....89 days. I both want it to come fast and hope it never comes. Returning will be strange and wonderful all at the same time. Okay no more philosophical stuff. We wrap up our first pass of testing today and I think the team is sick of me. It will be good for folks to get home and to move on to focusing on deploying this puppy. In contrast to other systems I have tested this has gone particularly well especially considering the quality/details of the design. I am very happy with my team's work these last two weeks. Time to get to work. 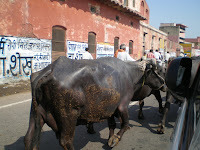 More reflections on India and photos on Monday. Have a wonderful weekend! Journey home = 24 more hours this time with super snore man on the train so no sleep. 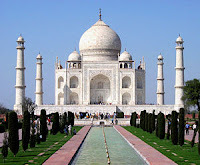 The king built it for his dying wife and it took 22 years and 20,000 workers to complete. Needless to say she died long before it was done. This king was later arrested by his son and put under house arrest in the Red Fort (just down the river from the Taj so he could see it) because he was spending all his time and money building ridiculous things (he planned to build a black Taj on the other side of the river). Very cool story. Everything at the Taj is symmetrical but the two graves inside. There are actually four graves; two upstairs for show and the two real graves downstairs that you can't see. The place is truely breath-taking. Check out the Wiki link on the right for more details. 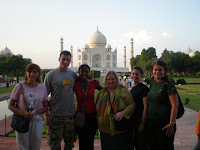 I'll try to get some actual pics of us at the Taj and on the train today and post them. Four more sleeps until I am back in the UK!!!! For your enjoyment! 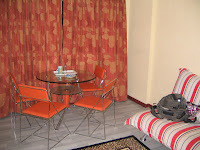 The living room of my thrid home here in the 'dumpster in paradise' which we now refer to as 'Palm Springs'. The 'Wave Pool' at Palm Springs. 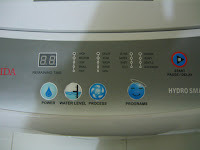 The washing machine has a Saree setting! 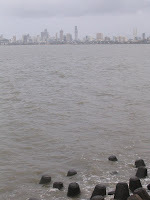 View across the bay in Mumbai from Nairman point. That's the Indian ocean and a few weeks ago I was on the other side in Mombassa Kenya. 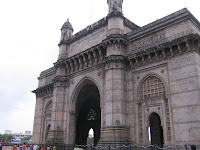 The Gateway of India. Sort of impressive but really just an empty structure our on a pier. 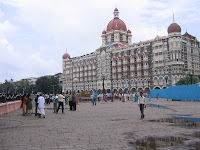 The Taj Hotel in Mumbai. 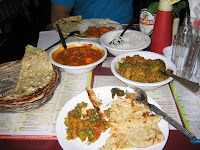 Our $6 lunch at Leopolds on Colaba. 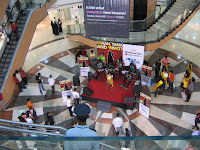 Mumbai 'Idols' singing at the shopping mall in Malad. 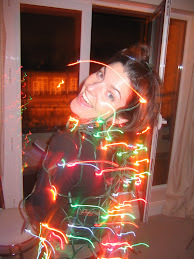 Okay I appologize as I have been the worst blogger ever! I also have one dead camera battery so I can't upload the photos. I know, I should know better. - moved into a fancy hotel. It's amazing and shiney and I have a dvd player and flat screen tv in my room. No complainte here. - hit the town with the team on Saturday. Basically did the same things as last weekend but with more shopping. We went to a place called 'Linking Road' which has a famous shoe market. If you like shoes this is the place to be. Stall after stall of sandals as far as the eye can see. Marte took snaps so I'll have to steal some. I didn't buy any shoes (as I had already bought four pairs and only have two suitcases) but we did a lot of trying on! - found a chain coffee shop (Baristas) and had a latte...yum...and yes that's a big deal! 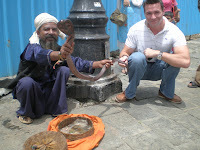 - ran away when Conor offered a man money to get his photo taken with a cobra...seriously. He looks pretty scared in the photos and is only touching the tip of the tail of the snake. I'll try to get that photo too. - went to the spa in the hotel and had a pedicure, eyebrow threading and 90 minute massage all for about $40 after having room-service for breakie...ah the luxury! These next two weeks will be quite crazy and the internet here is very limited (in scope not in bandwidth) so you may not hear much from me. Next weekend we are headed to the Taj on an overnight train so that should be fun and they'll be loads of things to report. Then I am headed back to the UK on Sept 22 to finish testing and deployment of this new system we have built. Fun fun fun! Hello from the office in Mumbai! It's been an eventful weekend. Unfortunately I haven't downloaded the photos but will try to do that tonight. Since I last wrote I have moved homes twice, spent a ridiculously small amount of money on a ridiculously large amount of shoes and killed an enormous amount of cockroaches! The whole team has arrived (except Susan and Nana who will arrive on Sunday) so we are a big group here in Mumbai. We are all living at the 'Royal Palms' which we like to call 'a dumpster in the middle of nowhere'. Seriously, I would send you the web link but it's so far from reality is funny. The place will be great when/if it's finished but right now it's half finised buildings with no amenities to speak of in the middle of nowhere. I am living in a roach infested 19th floor two bedroom apartment that they are apparently spraying as I type to kill the bugs. We'll see about that when I get home. Oh, I know I'll survive and it has become quite comical to be honest. I am staying with my teammate Khalila who is definitely more upset than I so I am focused on calming her down and killing bugs before she sees them....a little mission of mine. Enough about that. Conor and I headed into the downtown core on Saturday to see the sights. 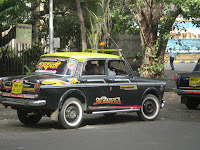 We visited the Gates of India and were going to take a tourist walk that was noted in my Mumbai book but ended up making it to only one street Colaba, and spending most of our day there. I went into the most glorious shoe shop and after about an hour of trying on sparkly lovlies walked out with four gorgeous pairs of shoes for about $80. Later on I followed a vendor into his back alley shop and bought a few pashminas ranging from 3-7 dollars. Did I mention I love this city for it's prices? We had lunch at a legendary cafe calle Leopolds and ate like kings for about $3 a piece. In the afternoon we went to Reid and Taylor and got measured up for tailor-made suits which we have to go back for a fitting for on the weekend...woohooo! I'll post photos of the events tomorrow. Spent sunday moving into my now hopefully bug-free flat and doing work (oh yes, there is a lot of work to be done here!) 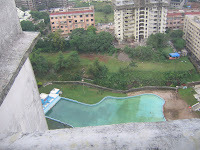 and visited the luxury hotel on the top of the hill in our complex. It was lovely with three restaurants, gym, spa, two pools and general hotel loveliness. I just sat in the lobby and read until dinner. I think we'll have to head there for dinner one night to check it out. Today we got down to work. The software developer has delivered the final pieces of code so the testing bonanza has begun. Those of you who know me from work know that this is where 'I'm a viking' so I am raring to go. Yay comfort zone! Another fun note...today I had hand delivered a postcard from Christie's trip to Norway that has reached me via Kenya. Talk about world mail! So fun. Okay it's time to head out to the mall for some more supplies (perhaps some bug spray?) and food. I'll do my best to post photos tomorrow. I hope you all had a wicked long weekend and that all of you teacher-types enjoy your days back at school!